A low-key vacation spot in Ontario is the right getaway from Washington, D.C. In the house that Richard Williams designed for David Frum and Danielle Crittenden Frum on Lake Ontario, floor-to-ceiling windows from Oldcastle offer views through the house to the lake beyond. A pendant lamp by Hans Wegner for Carl Hansen & Søn hangs above a custom dining table by Cabinet. The paint is Cloud White by Benjamin Moore, and the painting, titled Meshed, is by Anna Yuschuk. 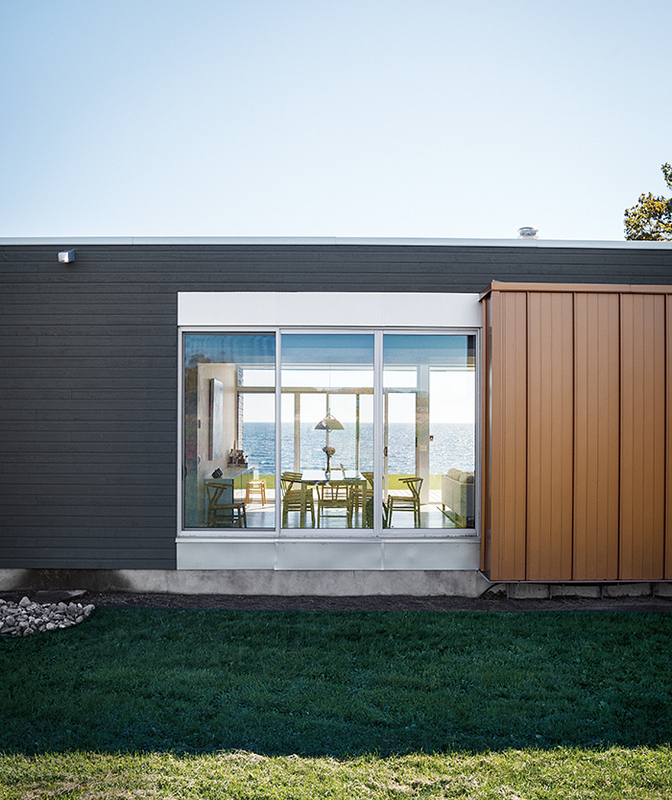 The facade is a mix of finished-wood siding and copper-hued aluminum. The living-dining area is outfitted with a Karlstad sofa from Ikea and a fireplace from European Home. “The light is always changing, minute by minute, hour by hour," says Williams. Crittenden Frum prepares food in the galley-style kitchen, which is outfitted with a Cascade Taupe Vintage countertop from Marble Trend. The cabinets are from Ikea, the range is by GE, and the Jenn-Air refrigerator is tucked unobtrusively into the pantry wall. The troweled concrete floor was poured in place by the builder, Peter Knudsen. In the master bathroom, Godmorgon vanities from Ikea stand next to a dual-flush Aquia toilet from Toto. A Tolomeo Wall Spot lamp, designed by Michele De Lucchi and Giancarlo Fassina for Artemide, hangs above the mirror. The chairs on the terrace are from the Rusa collection by KAA Design, and the Diamond outdoor sofas are from Cane-line. The bed was custom-made by Roen Furniture, and the Melampo Mini wall lights are by Adrien Gardere for Artemide. When you live in the contentious world of Washington, D.C., where do you go to get away? 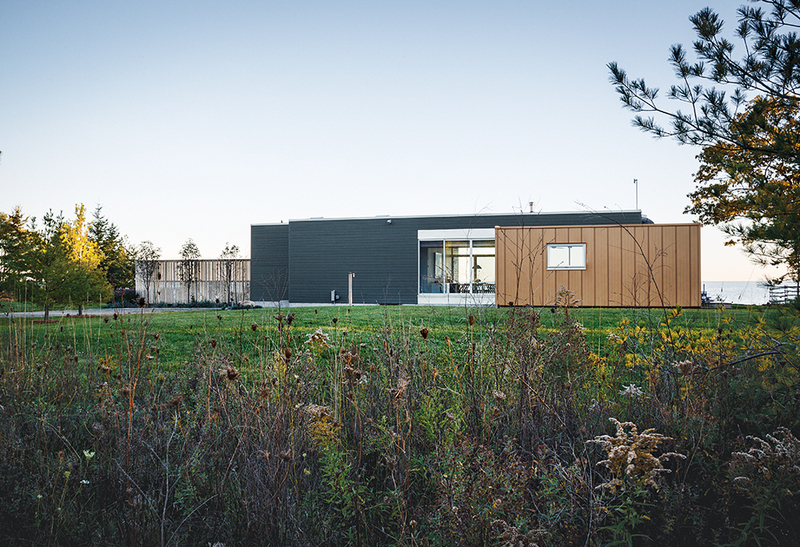 For David Frum and Danielle Crittenden Frum, escape isn’t to be found on the nearby Atlantic beaches, but rather in rural Prince Edward County, Ontario. This island community on Lake Ontario, two hours east of Toronto, offers soft-sand beaches, sophisticated restaurants, a still-strong sense of its agricultural roots, and a connection to family. “My mother has had a place on the lake for 20 years, and we’ve been coming here ever since,” says Crittenden Frum, an author and a contributing editor at the Huffington Post. That house became a hub for Danielle and David—a columnist and author who served as a speechwriter for President George W. Bush—and their three children. The area “had fallen on very hard times when we began visiting,” Frum recalls, but the beauty of its landscape exerted a strong pull. What followed was “this rejuvenation and efflorescence of the county,” as Frum puts it, with chefs, winemakers, and organic farmers taking up residence. “The place has discovered this second life as a preserve of Canadian agriculture and Canadian art,” he says. The family made the trip every summer. But as the children grew older—Miranda and Nathaniel are 23 and 20, respectively; Bea, the youngest, is 12—the pair decided to commission their own hideaway next to the house that Crittenden Frum’s mother, Yvonne Worthington, shared with her husband, the late journalist Peter Worthington. The Worthingtons’ property included a house, a barn, and, about 300 feet from the house, an open field bordered by buckthorn shrubs. That field became the site of Frum and Crittenden Frum’s new place, looking out on the vast blue expanse of Lake Ontario. The couple enlisted a Washington-based architect, Richard Williams, to design a concise building that would provide them with their own space and allow them to share in hosting duties at the compound. They’d already worked with Williams on their house in Washington, a century-old cottage that they restored and “took from 1905 to about 1927,” as Crittenden Frum jokes. For their Ontario getaway, Frum says, “We wanted to do modern, but we also wanted to do cheap.” That meant a firm budget of $500,000, including furniture and landscaping. Williams accepted the challenge, and they dubbed the project Twitter House—a building for a pair of writers that had to be eloquent within tight constraints. “It was about very simple ideas,” Williams says. “How do you reduce a house to the absolute bare essentials?” Their answer was a 1,500-square-foot modern layout that would include a bedroom suite, a study that could serve as a guest room, and plenty of space for friends and family. Within is an efficient and robust interior composed of simple, hardy materials. The main living and dining areas and kitchen occupy the west end of the house, surrounded by a wraparound deck; at the east end are the master suite and the combined guest room and study. The troweled concrete floor was poured in place by the builder, Peter Knudsen. The only flourish is a band of oak hardwood along the wall and ceiling of the northern edge of the house, defining a corridor from the front door through the galley kitchen to another door. 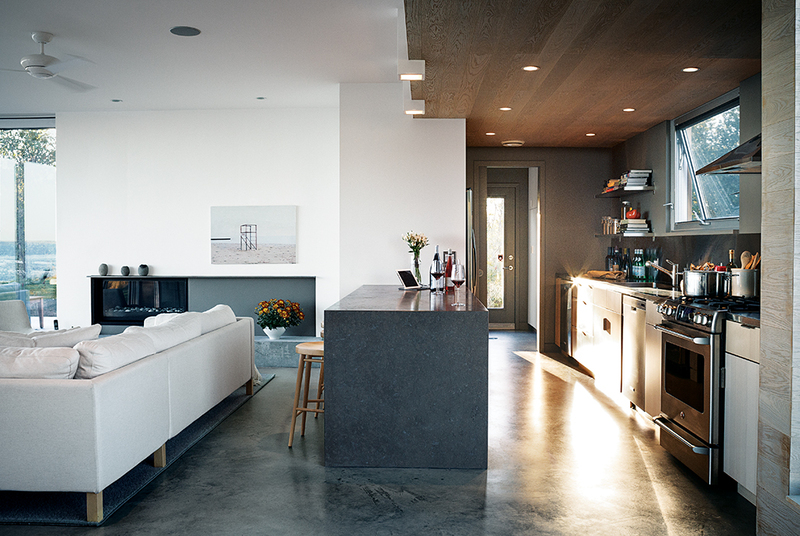 Working with Julie La Traverse, a Toronto-based interior designer, Frum and Crittenden Frum settled on an Ikea galley kitchen with stainless-steel countertops. Low-key furniture, a sideboard made with Ikea cabinets, and a custom dining table fill out the space. The dining table is the center of activity. Crittenden Frum recalls her mother’s comment at the first big gathering in the home, after a sampling of local wine: “You didn’t build a house. You built a party house!” At the same time, Frum adds, the building is just as comfortable when he and his wife are alone or with Bea, sitting together and watching the light shift slowly on the lake. “It’s constantly changing character,” Crittenden Frum says. “Walking into the house, you suddenly feel this incredible sense of peace. I can sit on that sofa looking out at the lake, winter or summer, at all hours.” Across the lake, Washington is hundreds of miles away.